A very bright dynamo headlamp with a well designed reflector and lens which produces a focussed pattern of light. The beam is shaped so that there is more light at a further distance, but a very sharp cut-off at the top. It doesn't dazzle oncoming traffic. All of these lights come with the standlight feature, which means they store energy to keep running when you stop. They also each have a switch and automatic mode for use with hub dynamos, though each of the lights can also be used with bottle dynamos. There are two basic versions, the normal 40 lux version which includes a reflector and is designed for most people, and the 60 lux "sport" version which produces more light but does not include a reflector. 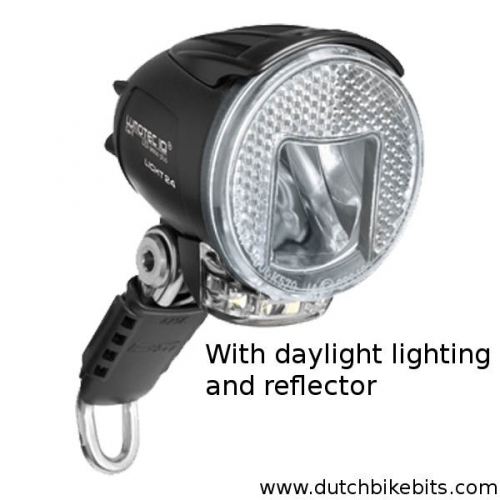 The daylight option provides a different "day lighting" pattern of light to enhance visibility during the day. This is primarily suitable for use with hub dynamos. These lights can also be used with 6 V DC from a battery, for example as the front light on a velomobile, but we recommend the e-bike version of this light for that use case. We recommend the 60 and 80 lux versions of this light as they produce more light in a better pattern than the 40 lux version. If the "daylight" feature is important to you then we suggest considering the IQ Fly T which offers a better pattern of "day lighting". 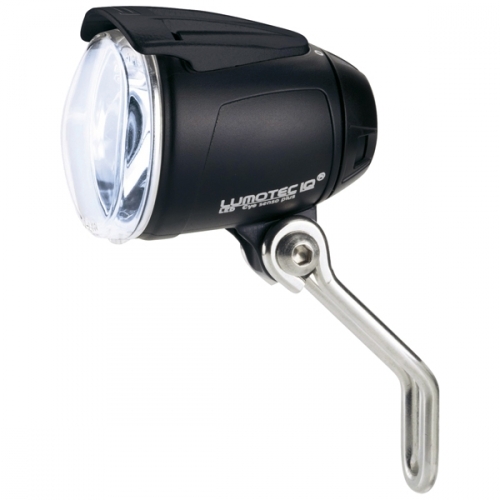 This light includes cable long enough to reach to a dynamo mounted on the front wheel, but does not include a second cable to stretch so far as a rear light.